It’s on the third floor with Lift with 2 bedrooms. One is a double bedroom with Air Condition and a ceiling fan. Open plan Kitchen/dining/living room with Air condition. In the living room, the sofa can be open into a double bed. Sleep another 2 persons. There are 2 large terraces which are private for your use only. On the second terrace, the one by the kitchen there is a table and chairs with real plants. The Bathroom has a solar system for hot water and there is an automatic washing machine. Towels and bed linen are provided free of charge. You need to bring your own beach towels. You will have 40 units free of electricity for 1 week. Extra units on consumption at .35c per 1 unit. Water and gas are included in the price. We need to collect 50c per person per night up to € 5 per person over 18 years. This must be paid when you will arrive at the property. For 1 week stay, it will be € 3.50 per person. Unlimited Wi-Fi is available on request at €15 for a 1-week stay. A bus stage is 1 minute away to get the bus to Capital city Valletta, for St Julian's and St Georges Bay. The apartment is 8 min walk to the front promenade and to Balluta Beach which is a Sandy Beach and Rocky Beach, restaurants and bars. Sliema and the coastline up to neighbouring St Julian's constitute Malta's main coastal resort. It is a centre for shopping, restaurants and cafe life. Sliema is also a major commercial and residential area. The Sliema promontory offers on one side stunning views across to Valletta and on the other, open sea views. The promenade, which runs for several kilometres from Gzira just south of Sliema to St Julian's, is ideal for walker and joggers. There are plenty of seats along the promenade and on summer evenings the seafront becomes a sociable meeting place for locals. Tower Road runs from Tigne to St Julian's on an attractive 2-mile rocky seafront where a romantic evening stroll is popular with locals and visitors alike. Along the Sliema promenade, you can arrange tours with the popular 'Captain Morgan' providing you with excursions to Malta's other islands like Comino, Gozo, visits to the Blue Lagoon, and day trips to Sicily. Transfers can be arranged on request. Food packs can be arranged on request. Malta has the most historical places in Europe. You can visit the Capital city Valletta, and the old capital city Mdina. Near Mdina there is Villa Roman Domus and St. Paul Catacombs in Rabat, and lots of more interest and historic places. In summer every weekend there will be a feast in a village on the Island. There will be a live band and fireworks on Saturday evening. On Sunday evening there will be a Religious procession with the Saint of the village with bands playing live music. When you are visiting Malta you can’t miss visiting our sister Gozo and Comino. You can also have a day trip to Sicily. Try our local Maltese Food, especially the local specialities rabbit, baked pasta, baked potatoes and fish. These apartments are in the centre of Sliema. Close to the beach, close to front promenade and minutes away to Paceville. The apartments are well maintained and with everything you need. Towels are provided. You must bring you own beach towels. Near the sea Sliema Front Promenade 5 minutes walk from the apartment. Free in white line on the road. First come first serve. Clean, private balconies, close to everything! My roommate and I stayed here while studying abroad. It is very clean, and everything you need is there. Josephine even provides adapters and maps. The kitchen is fully stocked with all tools you need to be able to cook. Very convenient clothes washer and private balcony for hanging clothes. 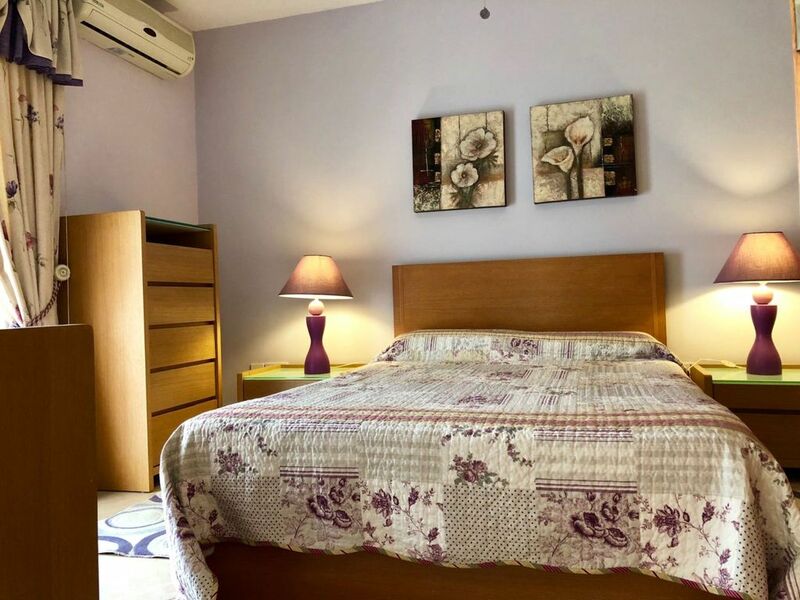 Also, the apartment is in quiet area, in the middle of Sliema, so you can either walk 10-15 minutes to the Sliema Boardwalk/Ferries, or walk 10-15 minutes in the opposite direction to get to St. Julian's area where there are lots of restaurants and pool clubs. I recommend UBistro. The Flat is also a couple blocks from police station, markets, and bus stop; which was convenient. The bus stop takes many routes, but will take you to Valletta easily, as my roommate and I took the bus everyday to Valletta to class. Valletta is also very nice. Josephine was very helpful and would come to the apartment if we needed anything, almost always answered calls, always returned missed calls. We stayed for a month, and we are glad we had the apartment we did, considering some of our classmates had terrible experiences with their living situation. The ONLY negative is that the internet has a data limit, which made it difficut to Skype/videochat with family back in the States. Other than that, we enjoyed our stay, very spacious and clean! Thanks Josephine! Thanks for staying in one of our 3 apartments in Sliema. We have 3 apartments in the same block which can sleep up to 15/18 persons. The apartments are in the centre of Sliema which are reachable to English Schools, to the beach, Sliema promenade and St Julian's within minutes by walk. Very beautiful apartment for 5 + 1 space on the comfortable couch. Good beds and enough storage space for your clothes. Fully equipped kitchen and very easy to use. Clean and beautiful bathroom with heater and washing machine. Satellite TV and wireless internet, many channels and easy to use. Supermarket is very close by and Paceville is just 15 minutes walk. Friendly owners and always prepared to help when you have questions. We are always there to help to make your holiday the best. The apartment is in the center of Sliema. Few minutes away from anything you want to do in your holiday. Thanks See you soon. Nous avons séjourné 6 jours dans cet appartement très agréable avec 2 terrasses. Le quartier est calme et pas très loin des bus (10 mn à pied). Les contacts avec le propriétaire ont été simples et efficaces. Nous recommandons. Sliema is minutes away from St Julian's. Sliema is in the most popular town on the island, with lots shops, restaurant, open cafes, beaches few minutes away by walk or by bus which is 2 minutes away for the apartment. Malta has the most historical places in Europe. You can visit the Capital city Valletta, and the old capital city Mdina. Near Mdina there is Villa Roman Domus and St. Paul Catacombs in Rabat, and lots of more interest and historic places. In summer on every weekend there will be a feast in a village on the Island. There will be live band and fire works on Saturday evening. On Sunday evening there will be a Religious procession with the Saint of the village with bands playing live music. When you are visiting Malta you can’t miss to visit our sister Gozo and Comino. You can also have a day trip to Sicily. Try our local Maltese Food, especially the local specialities rabbit, baked pasta, backed potatoes and fish. Come and enjoy our beautiful islands Malta and Gozo. Golf: Golf is played in Marsa Sport Ground, 20 minutes drive. Please send us flight details Arrival and Departure so we can send you arrival instructions of the apartment. Let us know if you need airport transfer. We can offer you a taxi or minivan.